Staff were great, location for what we needed to do was also great, the staff went out of their way t make our stay great. We were very impressed with the room (303) and overall a great stay. Good quality budget accommodation in convenient spot. Staff happy, and relaxed . Overall a very good and relaxing stay. If I had any questions or problems the reception were quickly on to them. the location was excellent and out apartment was really good. Very comfortable and affordable. Would stay there again. The only complaint was that we were on L2 across from the tennis courts of the othe hotel. Not the best when kids are out there at 8am on a Sunday morning. We only spent a couple of hours in the apartment as we may stayed one night. I really enjoyed myself. The rooms are clean, big and are good value for money and front desk staff very helpful. Wish I owned an apartment here! Great location! Great service! Value for money! Rooms renovated nicely. See you soon. These appartments are in an ideal location. Very clean, and well maintained, have never see such a clean bathroom before as this was.++++++++ The only negative was no aircon in bedroom or exhaust fan in bathroom. The living room aircon did help cool the bedroom a little with the ceiling fan on. The pricing was reasonable for the time of year. The kitchen was well stocked, ironing board didn't have padding but that was going to be attended to, not many people iron now anyway. The folding bed that was left in living area, needed new mattress foam had seen better days. Overall for price well worth the money. Undercover parking with easy access. 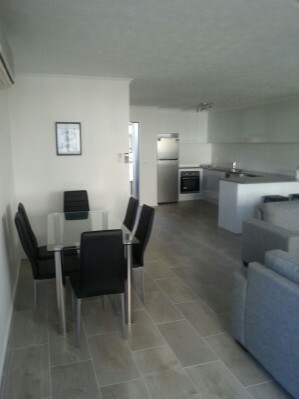 Split level lux 1 Bedroom - very fresh, clean and modern appartment. Staff at reception very helpful. Excellent stay. Staff were friendly, close to beach & restaurants. Room was clean, tidy and spacious. Will definitely stay again when I visit the Gold Coast. Wonderful place for us to relax for the night! This hotel was fantastic, great for the money and exactly what we needed for one night. The overnight stay was very good great location for wht we wre doing only issued but not a big one is did not like the 2 single beds joined together to make up double bed needs a cover or some thing over the joining of beds. The apartment was well located, clean and comfortable. Would recommend to family and friends staying in this area. Great, service good and an ideal location for me. Again, fantastic. Have booked our third stay for January 2016 and can't wait. Great place to stay although there was insufficient cutlery and plates if a family were staying. Only stayed overnight. Clean, comfortable, fresh and close to everything. It was very relaxing and enjoyable and is in a great location relative to the beach and shopping centres. On arrival a bit disappointed with outside as a bit tired looking and did not look much like the photos which is all we had to go off when booking. The young staff we found to be excellent, friendly and very helpful. Well done there. The appartment was clean and comfortable. Had all we required. A bit noisy at night from traffic, which we know cannot be helped, some yelling and noise from people early hours of morning. Great location to everything and felt safe. Ideal walking distance from shops, conference venue and beach. Lovely decor, good shower setup floor outside shower is dry. Although room has no aircon, the fan was helpful. Great location, value for money, all round a great stay. The rollaway bed was extremely uncomfortable with springs sticking up. My sister lent us a blow-up mattress to use for the week. On the Saturday night I only got to sleep at 4 because there was a party above us and every time something was dropped on the outside courtyard, which was directly above my bed, I heard it. There was also broken glass and cigarette butts on our deck area the following morning. Apart from that, I loved the location and the friendly staff. We had a rental car so it was super convenient having a secure car park. We walked into Broadbeach for dinner and to Pacific Fair for shopping. It was also really easy for my sisters to find us when we were going out together. Suited what I was after.